A lunchtime topic came up today regarding Web Analysts and Conversion Optimization specialists. We started debating what each job was all about, what the similarities were, what the differences were, and whether you could be good at both. Why should I read this post? What’s in it for me? You are thinking about a career shift from one discipline to another (e.g. 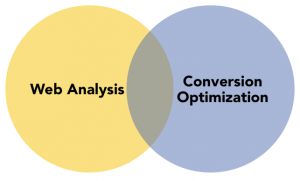 Web Analyst to Conversion Optimization Specialist). You are developing Conversion Optimization practices within your organization, and wondering if internal resources can help fill gaps. You are recruiting externally for either skill set, and wondering about the overlaps, differences, etc. You are early in your career, have interest in both, but want to know which discipline to focus on when developing your skills.